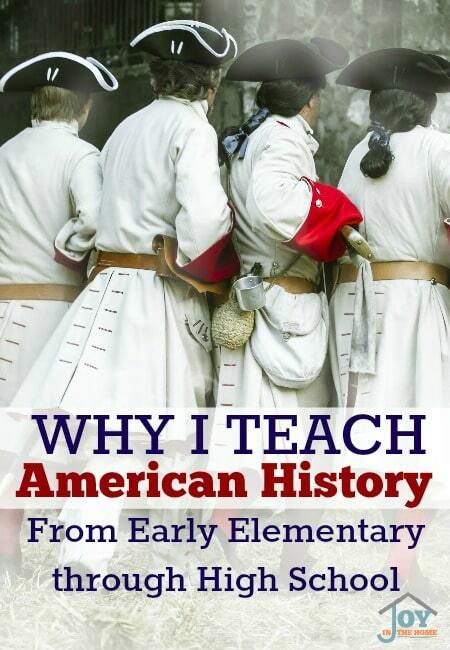 Once a reader found out that I focus on American History from early elementary through high school, usually ending around 9th or 10th grade, before turning our full focus on World History, they wanted to know my reason behind it. I know this is something completely different than how the majority of homeschoolers study history, but has really worked for us and it may be what you are looking for in your homeschooling journey. When our older children were younger, and I started to implement the Charlotte Mason way into how we did homeschooling, I learned that American history books were being rewritten, to take our Christian founding out of it. As I researched this myself, I began to see clearly that newer books, written after 1965 were in fact focusing on more of an economical purpose to the founding of our government and thus the Christian faith started to disappear from these books. Interestingly enough, as I did my research, I was finding that the bibliographies (a list of sources quotes or information are taken from) in the books written after 1965 were only quoting books written about history from that point on and some were even without any bibliographies. History of any kind, should always contain sources from original documents or books that used the original documents as their source. Once we were seeing this for ourselves, we decided that we wanted to make a focus on teaching our children a solid history of their nation and the founding of its principles, laws and statues. Our purpose in teaching American History was to not just teach names, dates and events, but allow them to get a full picture of what the people were standing up for, what was going on in their lives and why these events happened, while understanding what made them important to our American History. In order for us to implement our purpose with our family, we needed to take steps in building their knowledge in history and it literally took us this long to do it where our children were interested in learning and able to retain important information, thus becoming true patriots to the founding of this great nation and what all these principles stand for and still stand for today. We have found our children able to grasp different things about American History at different ages, but it wasn't until they were in middle school and high school before the principles that formed this nation made sense to them, and all the foundational work we did to teach them the ‘facts' and ‘events' all started to make sense at this age and gave us the ability to educate our children in what we believe is a very important of their education… their duty to their nation, founding in their faith in God. With all this being said, I want to also be sure to state that although our history curriculum was focused on America, we never left out learning about Bible History or even World History. In fact, it amazed me how we taught American History because a genuine interest in other history for each of our children and they were grasping so much through life that was didn't plan or structure for these studies. Often times, we used our sick days or summer months to learn about different parts of history, which first started by our sons love of learning about weapons and the history of weapons. The naturally lead us to wars, and world wars that gave them interest in learning more about why they happened and who the historical people of those times were and what they stood for because this is how they were trained to learn through our American History. I remember one summer, our oldest son spent a lot of his free time learning about World War II because of his interest of the weapons that were used and the hours he would spend watching the History channel with his dad, having long discussions about the holocaust and the persecution of the Jews during that time. Although we were only focusing on American History, my children were thrilled to learn about many who lived during that time. Our approach in teaching history may not be popular, but the fruit of our approach has been beautiful to see and we have absolutely no regrets, as we know our children love history of all kinds, and have a solid education about their own country's history and are proud to be Americans who know the founding, the principles and what sacrifices have been made by so many to get our freedom and to keep it.